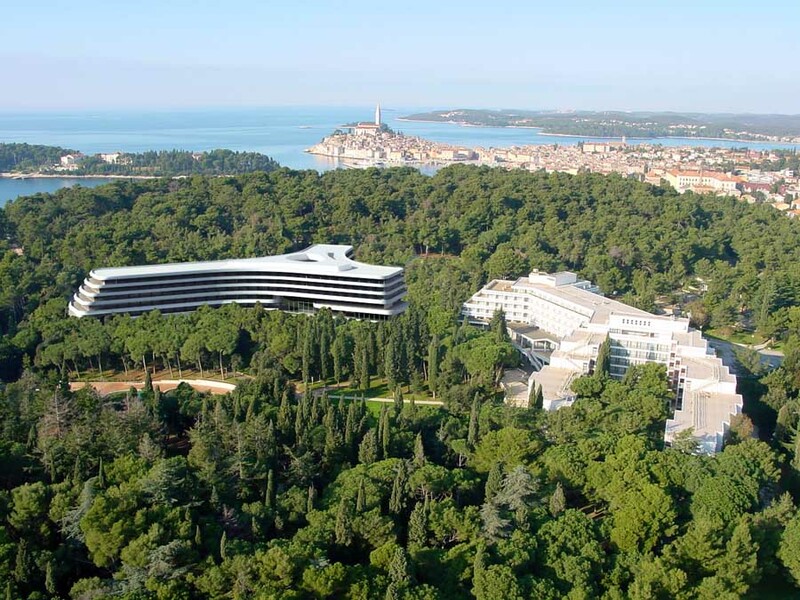 Hotel Lone, the first design hotel in Croatia, is situated in a unique and protected region of Monte Mulini forest in Rovinj. It was created by a team of architects, artists, product, fashion and graphic designers. The hotel’s identity is defined by façades dominant horizontal lines – terraces evoking the image of slanted boat decks. 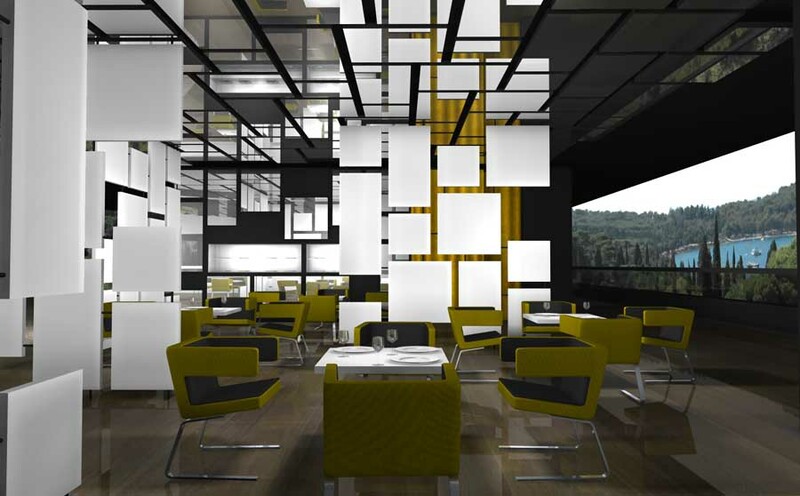 The interiors and the furniture were designed for the hotel in order to achieve a recognizable identity. 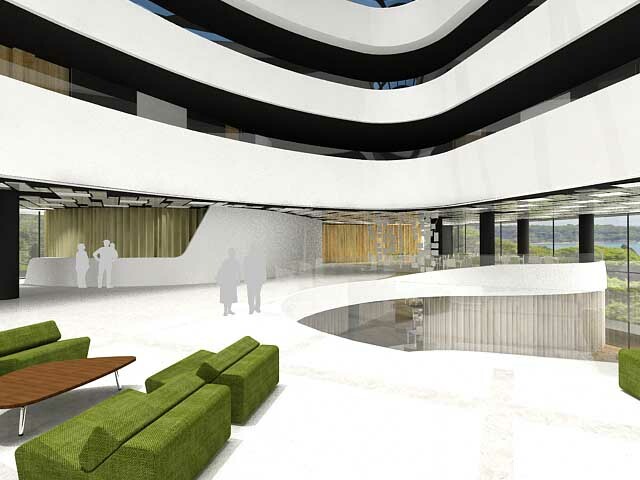 The Y shaped ground plan enabled a rational and functional organizational scheme; quality views from all rooms and the grouping of public facilities around a vertical lobby that connects common spaces on all levels, creating a central volume of impressive height. Surrounding landscape is the hotel’s signature visual element which also defines all views of the interior. The ambient light and Mediterranean greenery reflects on the glossy surfaces in public areas and on the mirrored panels in the rooms, pulling them deeply into the interior and intensifying the effect of the surrounding plants. The conceptual assumptions used in the design of the hotel and its interior show evidence of a deep respect towards the achievements of modernist hotel architecture on the Adriatic Coast from the previous century, combining it with a strong conteporarity expressed in materials, functions, typologies and in architectural forms. The buildings compact form gives it a favorable form factor and a minimal loss of heat through the surface area. Energy use for cooling is minimized with reduced solar heat gains through the main elements of the facade – deep eaves formed by continuous parapet balconies. Optimal air-conditioning was achieved by implementing air to air heat pumps with low noise units, small required installation space and, thanks to high energy efficiency of inverter driven compressors, minimizing running costs and CO2 emission. The term design hotel is meant to illustrate this as a space that nurtures the concept of an interesting and functional design. Created by a team of renowned Croatian creatives comprised of a new generation of architects, conceptual artists, product, fashion and graphic designers. The Architects from studio 3LHD were responsible for the design and construction of the hotel building. In addition to the overall architecture, the interiors and the furniture were designed and chosen especially for the hotel in order to achieve a distinct and recognizable identity. The designers from Numen / For Use designed the furniture. The fashion studio I-GLE designed the staff uniforms and other textiles. Artist Silvio Vujičić created graphics on fabrics for the rooms. Installations in the hotel lobby were made by a group of innovative artists: Ivana Franke – “Room for running ghosts”; Silvio Vujičić – “In the hanging garden no one speaks” and the fashion studio I-GLE – textile compositions No1, No2, No3. 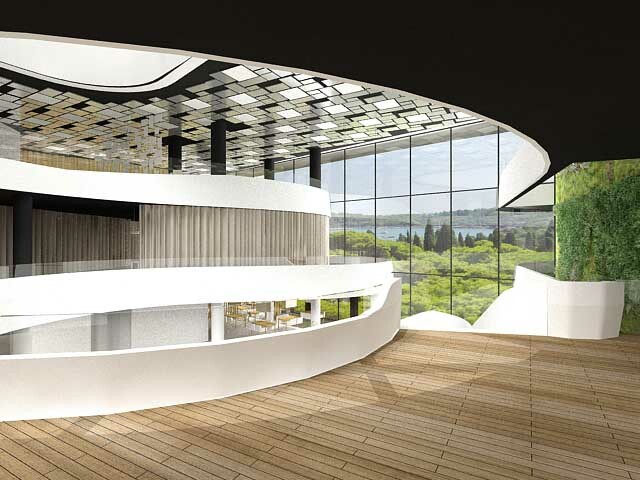 Studio92 designed the Wellness & Spa center, while Studio Kappo did Landscape design. The agency Bruketa & Žinić OM conceived and oversaw the visual identity of the hotel. The hotel’s identity is recognized through the external design of the building, with a facade that is defined by dominant horizontal lines – terrace guards designed to evoke the image of slanted boat decks. The building’s floorplates contract from level to level going up, creating an elevation that is tapered at all angles. The site’s complex terrain with dramatic altitude changes determined the locations of internal facility spaces through a dynamic interweaving of public areas and guest suites at all levels. The specific Y shaped ground plan enabled a: rational & functional organizational scheme; quality views from all rooms; and the grouping of public facilities around a central vertical lobby. 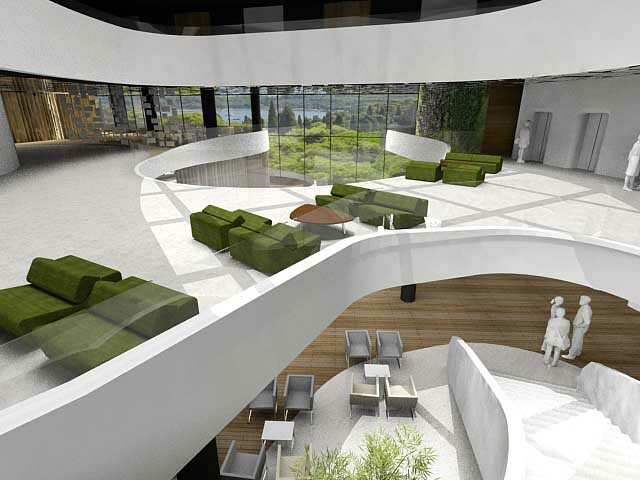 The main lobby connects common spaces on all levels, creating a central volume of impressive height and scale with interesting views in and around where all vital functions of the hotel take place. The key to the concept was the awareness of the necessity to avoid the sterility of most hotel facilities; that is why the designers used textiles with rich textures and quality oak veneer treated with eco-friendly lacquers, which give the visual and tactile impression of untreated massive wood. This material is usually too rustic but in this execution it manages to integrate walls and spaces into a harmonious composition through contemporary design and purified, spatially articulated shapes of paneling that overflow into furniture. The hotel has 236 rooms and 12 suites. 16 rooms offer an exclusive experience of a private massage pool built in the room’s terrace. All the rooms are suitable for all types of guests. Rooms with king-size beds, twin beds or connected rooms are suitable for families. The hotel has three restaurants “L”, “ON” and “E”, two bars, a jazz club and a mini club. The hotel’s lowest level has a wellness center inspired by the Mediterranean. Besides a big pool there is a fitness center, massage rooms, a relaxation zone with a vitality bar, saunas and hydro massage pools – so called “sunken rooms”. Hotel Lone is a virtual shop window of the South-Eastern European creative industry. Its visual identity was designed by the agency Bruketa & Žinić OM, with several awards one of the most lauded agencies in this part of the world. Monte Mulini zone is the most attractive tourist zone in the city of Rovinj, situated on the western coast of Istria, characterized by a vast park-forest and hotel architecture from the 1970s, which over time has lost its envisioned exclusivity. Lone Hotel is situated in the park-forest of Monte Mulini, in the immediate vicinity of the Eden Hotel, the “star” hotel of the 1970s. The area surrounding the hotel is a unique and protected region of the Monte Mulini forest, whose preservation was a priority during the project’s design. 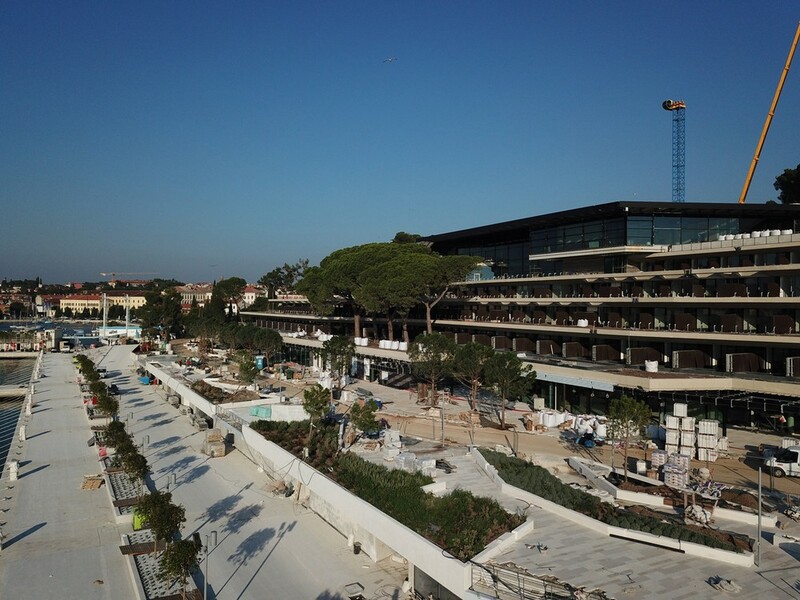 The hotel’s identity is recognizable through the external design of the building with the facade that is dominated by horizontal lines – terrace fences designed as diagonal boat decks so that the ground plan becomes smaller at higher levels. The complex terrain with large altitude differences determined the disposition of internal facilities through a dynamic interweaving of public areas and accommodation units at all levels. 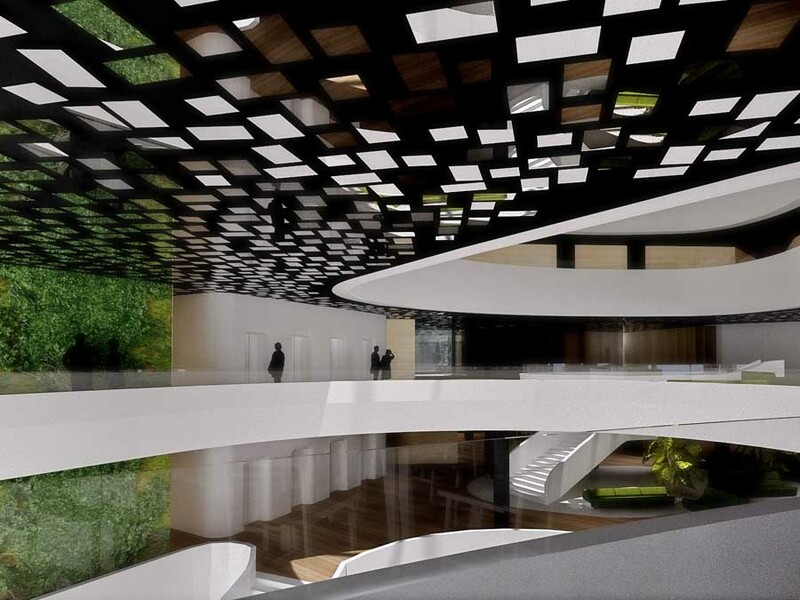 The ground plan in the shape of the letter Y enabled a rational functional organizational scheme, a quality view from all rooms and the grouping of public facilities around a central lobby which is a vertical aerial space of the hotel. Thus was created a space of impressive height and size with interesting views in and around which all vital functions of the hotel take place. 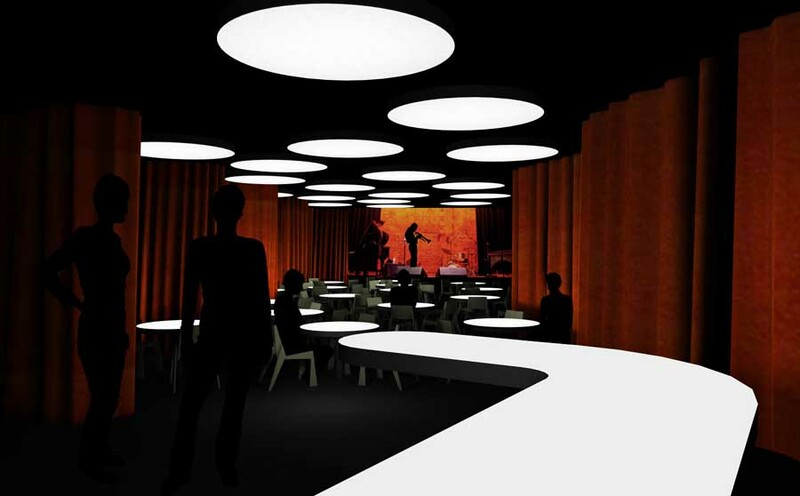 The surrounding atmosphere of the hotel was selected as the hotels’ signature visual element and should define all aspects of the hotel’s interior. With that in mind, the walls are intermittently covered with mirrors which reflect ambient light and Mediterranean greenery, thus pulling them deeply into the interior and filling it with the exterior. The light and open space of the lobby covered in white stone surfaces, beige-golden fabrics, oval lines of the fences and the furniture enhance the fluid character of the space and are in contrast with the intimate, subdued tones of the rooms and apartments wherein the atmosphere is calmer, materials warmer (wood and carpets), the colors darker and lighting dimmer. 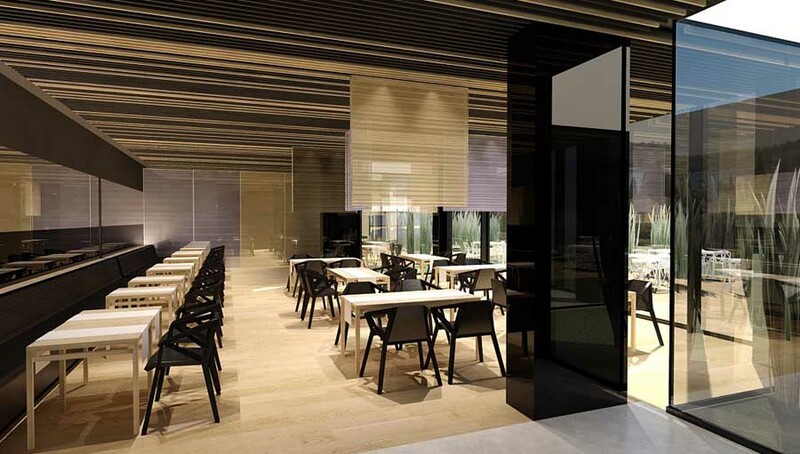 The entire design of the hotel is based on contrasts (black, white wood) and fabrics as the unifying element, varying from a fluid thin veil in the restaurant, through functional but dynamic wall coverings in the rooms, to the richly decorative mural in the lobby. 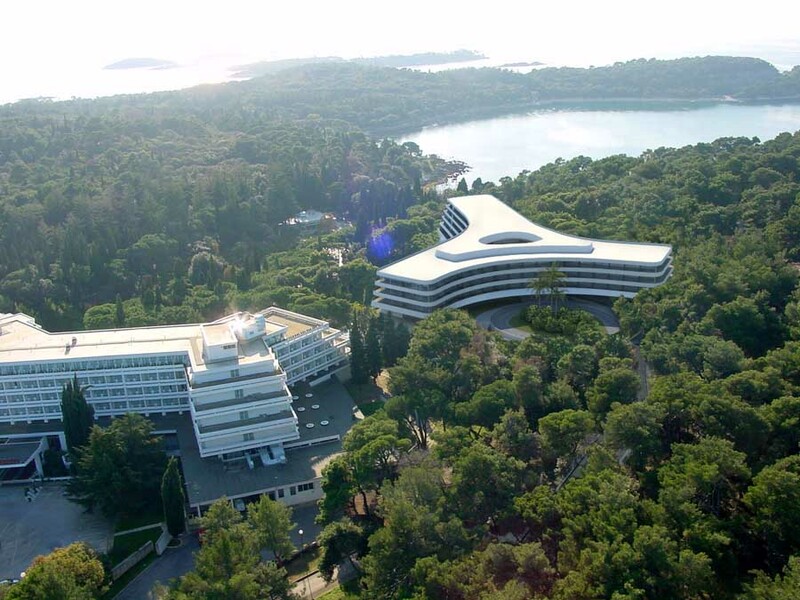 Several young Croatian designers and artists took part in the creation of the hotel’s identity: a team of product designers Numen ForUse, fashion designers from the studio I-gle and conceptual artists Ivana Franke and Silvio Vujicic who designed the interior, furniture, lighting, decorative fabrics and installations. Furniture and the coverings made of massive wood were chosen for their pronounced materiality and the dignified aging of surfaces that can be restored easily. The overall impression of the interior design, as well as the general visual style of the hotel, shows evidence of a deep respect towards the achievements of hotel architecture from the previous century, combining it with a strong contemporariness expressed primarily in materials functions and typologies and consequently in forms. Considering that the owners’ intention is to make this hotel the leading destination in the fall and winter months of the Monte Mulini zone, the disposition of facilities enables activities and operations adapted to all seasons. The interior and the furniture are designed especially for the hotel in order to create a clear and recognizable identity. 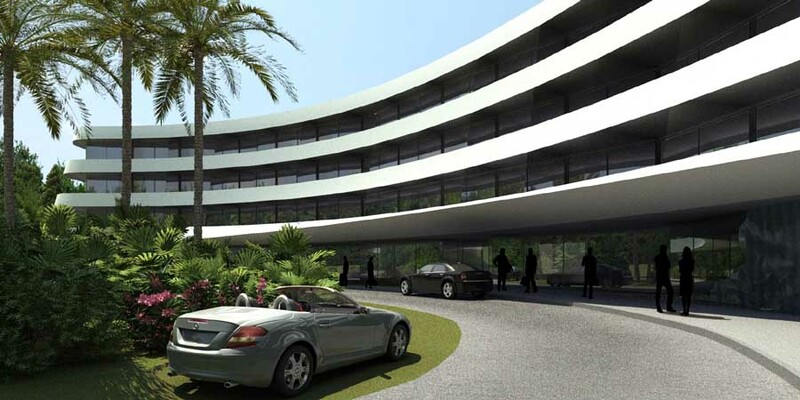 All services and accompanying facilities and their entrances, including the underground garage, are hidden from guests’ view. The hotel functions as a catering establishment, which encompasses diverse services with the common denominator of uncompromising luxury. In June 2008 Hotel Lone became member of the Design Hotel AG Group, an international company with its headquarters in Berlin that promotes exquisite hotels of original and unique design.